Two weekends ago, Bear and I attended our first herding trials ever. We attended a few classes this spring and Bear is getting better and better with the sheep. I am also getting better at handling so I was hopeful we would be able to at least achieve either a Herding Tested title under CKC rules or a Junior Herding Dog under AHBA rules. Our first run ever went much smoother than I had imagined, we made it around the course, Bear did his downs when asked and did not even try to grip sheep. It seemed like the run lasted forever but we were done in under 3 minutes. In hindsight it was the nicest run of the weekend and the judge even said it was one of the nicest Junior Herding Dog (JHD) runs he had seen in a long time – I was thrilled! There is no score in JHD runs, it’s a pass/fail evaluation, but we received “good” (highest evaluation category) for each element of the course! Our first run on Saturday morning was a CKC Herding Tested run. Bear was quite rested and wound up so I decided to use my ‘down’ cue a bit more to keep Bear off the sheep. He was quite vocal and I was worried that between the barking and trying to come around to the front of the sheep, the sheep might just decide to make a run for it! Of course, if you ask Bear, getting the sheep to change direction is a wonderful game – but it makes for a less than smooth run. That being said, we made it around the course in under 2 minutes and qualified in our first CKC run. Our second run on Saturday was well after lunch, the sun was blazing and it was around 25 degrees. The heat did not dampen Bear’s enthusiasm and we made it through the run quickly and efficiently, earning our second Herding Tested Leg and our Canadian Kennel Club Herding Tested Title! My videographer was in the city shopping so we didn’t get a recording of the run – just imagine it was nice! Our third and final run of the day was just around supper time – it was around 30 degrees Bear was fresh as a daisy and held it together (no gripping!!!) and once more, we made it around the course successfully, earning our American Herding Breed Association Junior Herding Title. After earning our Herding Tested title on Saturday, I decided to move Bear up into the next class – Herding Started. I already knew we could make it around the course obstacles – even if I was no longer allowed to lead the sheep through. What I was not certain of was whether we would be able to get the sheep out of the sheep pen successfully and safely or if I would be able to call Bear off the sheep. The pen anxiety was a result of a not so successful experience in a round pen and the call off concern was a result of never having done an off-leash call off. The first run of the day was a bit nerve wracking. We actually successfully took the sheep out of the pen – I went in with Bear and gave him the easy cue as the sheep were nearing the gate and a down cue as they left. I then called him out of the pen into a stay while I closed the gate. By this time the sheep were on the other side of the pen – Great. Another less than successful experience came to mind. The one with sheep running all over the arena with a large black blur behind them. The one where I was running all over the pen and left out of breath and hoarse. This went on for about 5 minutes. I was able to collect the sheep and make it through an obstacle but the sheep were quite wild and running like crazy for the exhaust pen gate. Finally the judge said “thank you, that’s enough” and I managed to collect Bear and leave. I was thrilled with maintaining control in the take pen so considered the experience an education. Next time, I get sheep that wild, I will call it much, much earlier and leave the pen before Bear has the opportunity to be silly. A few minutes after the run, I was told that one of the sheep in the group I had was actually removed from the trial flock the day before. She was young, too flighty and (I assume) likely to injure herself. I assumed that the luck of the sheep draw was part of the game but we were going to be given the opportunity to re-run the course again, once all the other classes were complete. The second try of the first run was at least a million times better. The take pen was under control (Yay! ), we made it around the course without the run looking like a game of sheep-bowling (WooHoo! )….and Bear actually walked away from perfectly chase-able sheep…YEEEHAAAW! We re-penned the sheep and I left the ring feeling so much better about things. I had no idea how herding is scored so I was not sure if it was a qualifying run but I was sure that it was a huge improvement from the first try. Guess what? We QUALIFIED! I know we placed 5th, I can’t remember the score. The second run of the day and our last run of the trial was even better then the one before. Sheep made it out of the pen safely, around the course reasonably and Bear heeled away from the sheep with me again! we qualified for a 6th time that weekend and came in second place, earning a pretty red rosette! Bear showing off his weekend loot! All things considered, I was (still am) beyond thrilled we earned two titles and I learned a lot about herding in general (saving that for another post). After watching some more advanced runs with some really nice scores (98-99) I can see we have a lot more to learn and I can’t wait. Having been to lots of dog events, I am never sure what to expect when I go to trial in a new venue. 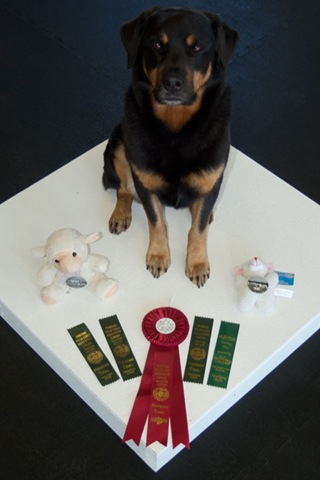 Bear was the only Rottie there and actually only one of two dogs in the trial not in the CKC herding group (the other was a terrier). I really enjoyed the relaxed atmosphere and how encouraging people were. A few people mentioned how nice it was to see a Rottweiler working and both judges mentioned the Rottweilers they had worked with/judged/evaluated and I have a few more kennel names to add to the list of people to check out whenever we’re ready for another dog.